KTM 125 Duke vs Yamaha R15 vs TVS Apache 200 - Best motorcycle in Rs 1.3L ? KTM 125 Duke vs Yamaha R15 vs TVS Apache 200 – Best motorcycle in Rs 1.3L ? KTM Duke 125 has been the latest addition in the Indian auto industry's entry level sports bike segment. New KTM 125 Duke has just been launched at an introductory price tag of Rs 1,18,163. Even though it does not have any direct competitors, it can still be slotted against other performance oriented bikes that are available in the same price range. We identified two such bikes, Yamaha R15 S and TVS Apache 200, which are available for Rs 1,16,746 and Rs 1,10,805, respectively. Here’s a quick comparison between KTM 125 Duke and its rivals to understand evolving market dynamics in performance-oriented bike segment – KTM 125 Duke vs Yamaha R15 vs TVS Apache 200. Design and features: KTM 125 Duke has minimal bodywork of the three bikes and a riding position that falls somewhere between aggressive and comfortable. TVS Apache 200 comes second in terms of bodywork whereas Yamaha R15s has maximum body cladding. Apache 200 offers the most comfortable riding stance of the three bikes whereas Yamaha R15s has the sportiest riding position, as evident in its clip-on handlebars and slightly rear-set footpegs. Both 125 Duke and TVS RTR 200 have all-digital dash whereas Yamaha R15 S offers a semi-digital instrument cluster. Dimensions: At 149 kg, TVS A200 is the heaviest among the three bikes. Surprisingly, KTM 125 Duke is just a kg less, even when it has minimal bodywork. The lightest is Yamaha R15s weighing 134 kg. 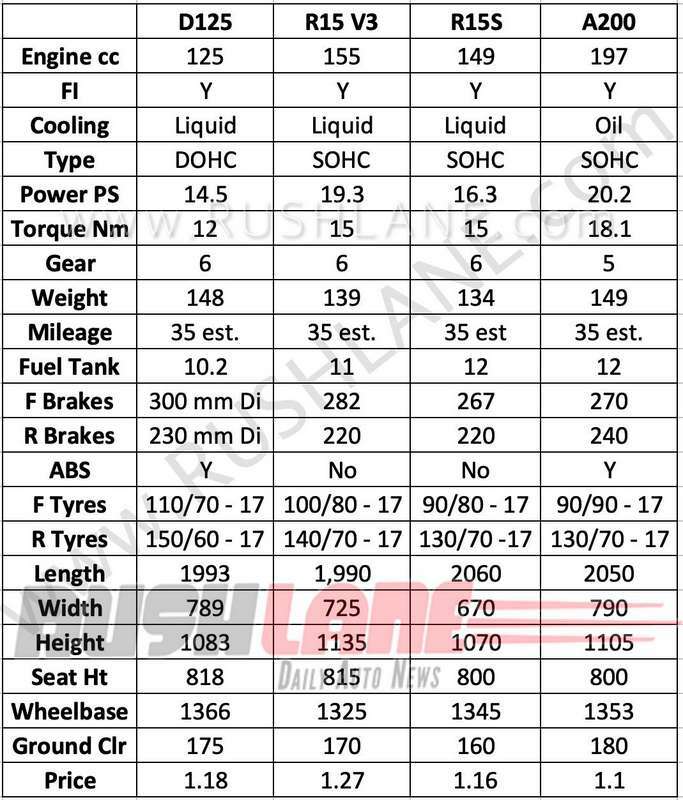 In terms of wheelbase, KTM 125 Duke is 1366 mm wide, followed by TVS at 1353 mm and Yamaha at 1345 mm. Talking about suspension, all three bikes have monoshock rear suspension. Front suspension is the same for TVS and Yamaha, as both have telescopic fork suspension system. 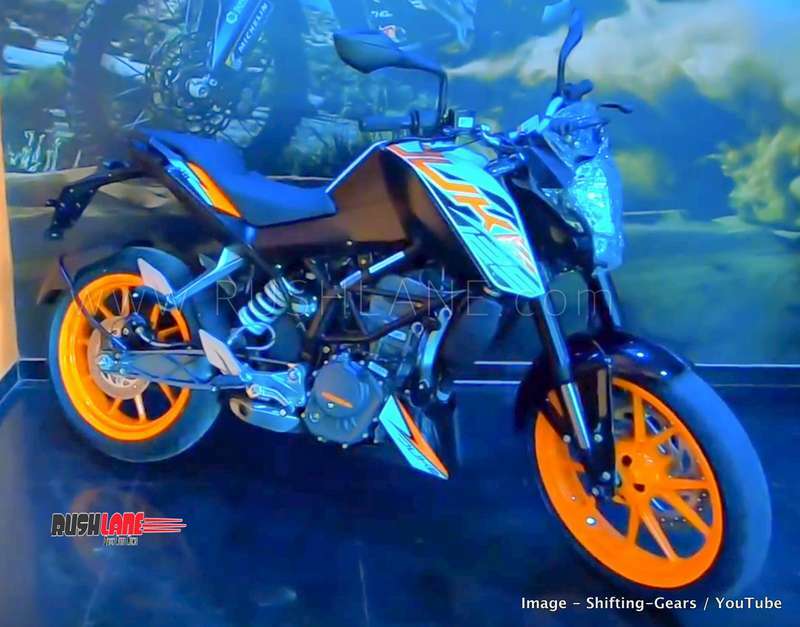 KTM 125 Duke comes with inverted front forks. Both TVS Apache 200 and KTM 125 Duke offer ABS, but the one on KTM is only a single-channel ABS system. Yamaha R15s does not offer ABS. All three bikes have disc brakes at both front and rear, with KTM having 300mm/230mm discs, TVS 270mm/240mm, and Yamaha 267mm/220mm. Engine & transmission: KTM 125 Duke has a 124.7 cc, single-cylinder, liquid-cooled DOHC engine that makes 14.5 hp at 9250 rpm and 12 Nm at 8000 rpm. Engine is mated to a 6-speed transmission. TVS Apache has a 197.7 cc, single-cylinder, oil-cooled engine that delivers 20.5 hp at 8500 rpm and 18.1 Nm at 7000 rpm. Engine is mated to a 5-speed transmission. Yamaha R15 S has a 149 cc, single-cylinder, liquid-cooled engine that makes 16.6 hp at 8500 rpm and 15 Nm at 7500 rpm. Engine is mated to a 6-speed transmission. KTM 125 Duke is the most affordable KTM to be launched in India, which could attract customers looking for performance-oriented bikes. In terms of competition, it’s unlikely that KTM 125 Duke will have any impact on sales of Yamaha R15 S and TVS Apache RTR 200 4V ABS. Even when their pricing is in the same range, all three bikes have entirely different power rating. This comparison was largely a fun exercise and should not be used to decide which one is the best entry-level performance oriented bike. Conclusion– To sum it up, it is the Yamaha R15S, embodies the best of style, features, performance in an efficiently priced package. TVS Apache 200 offers a decent package. It is also the cheapest and the most powerful bike on offer. KTM 125 Duke on the other hand, comes with the most expensive price tag, and an outdated styling. Only if KTM India had launched the D125 with the new gen styling, like they have done in markets outside India; the conclusion would have been different. To answer the question – best bike in Rs 1.3 lakh, it is the Yamaha R15 V3. Not only it is the fastest, it is also the most attractive bike out in the segment. Disclaimer – The manufacturer (TVS Motor Company) has blacklisted Rushlane from it’s events/rides as a consequence of decisions based on restrictive practices. This blog is reliant on available media material and study notes (press sourced).